You may have heard the comparison between a camera and the human eye. Just as a camera takes in light and transforms it into an image on film, your eye does virtually the same thing, only the “film” is your retina and your brain “develops” the image. We see objects when light, which is reflected by the objects, passes through the lens of the eye and strikes the retina, at the back of the eye. Our brains then interpret the shapes, colors, and dimensions of the objects we see. A clearly focused object is the result of normal vision. However, just as an improper focus of light entering a camera lens will blur a photo, if light entering the eyeball does not focus properly on the retina, the result is blurred vision. Figure 1. How the eye sees. Light from an object, such as a palm tree, is focused by the cornea and lens onto the retina. The retina turns the light into electrical signals that travel through the optic nerve to the brain, which identifies the object. It is helpful to think of seeing as six distinct steps, out- lined below, which are roughly similar to the way a camera processes an image (Figure 1). Suppose you are on a tropical beach, looking at a palm tree as its fronds wave in the ocean breeze. You’re actually see- ing the light from the sun reflecting off the leaves. That is why you can’t see in the dark: there is no light present to reflect off objects and enter your eye. The light reflected from the leaves reaches your eye. It first enters the cornea. The cornea is the part of your eye you touch when you put in a contact lens. It is a transparent dome, the size of a dime and as thick as a credit card. The cornea provides most of the eye’s focusing power, so small changes in its curvature can make an enormous difference in how clearly you see objects. The curved surface of the cornea bends the incoming light so that the rays converge together, instead of remaining parallel as they enter the eye. 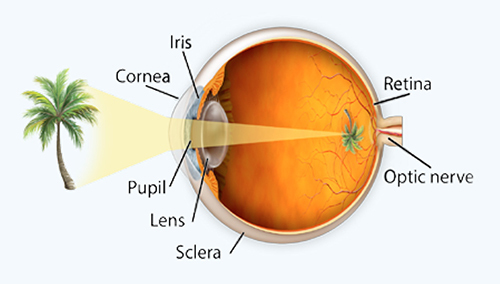 Thus, the cornea does the initial focusing work of the eye. After passing through the cornea, the light reaches the pupil. The pupil is a hole in the iris, which is a thin layer of tissue in the middle of the eye. Muscles in the iris constrict or dilate the pupil to let the optimal amount of light pass through into the eye’s interior, just like the f-stop in a camera. The light that passes through the pupil then enters the lens of the eye. The lens is behind the iris. It rapidly adjusts its focus for distance or near vision. The lens provides the final focus to create a clear image for the retina. The light reaches the back of the eye, where the retina lies. If you have normal vision, there is a clear image of the autumn leaves on the retina. The retina’s photoreceptor cells, the rods and cones, convert the image of the leaves to signals that the brain can understand. Finally, the signals are carried to the brain through the nerve bundle at the back of the eye—the optic nerve, which consists of millions of nerve fibers. The brain receives and in- terprets the signals, and it is at that point that you actually see.